MY SHORT SUMMARY: Elimelech and Naomi were married. They originally lived in Bethlehem but left because of a great famine. They relocated to Moab with their two sons, Mahlon and Chilion. Their sons married Moabite women called Orpah and Ruth. Unfortunately, Elimelek and his sons died, leaving three widows. Naomi was so sad about this and decided that she would return back to her home in Bethlehem after spending 10 years in Moab. She told her daughter in-laws Ruth and Orpah to go back to their fathers’ house and remarry because she could not give them sons to marry again. Orpah left, but Ruth pleaded with her to stay. When they arrived at Bethlehem, Naomi told her people to call her Mara, because she was ‘bitter’ at what the Lord had allowed to happen to her. DO YOU TRUST GOD? Elimelech and Naomi were in a situation and faced with two options; trusting God or running, they chose the latter. It was a decision that cost Elimelech and his two sons their lives. We read that they left Bethlehem (which means ‘the place of bread’) in Judah (‘praise’) to go to Moab (which means ‘from father: what father?’) and in the meaning of Moab you gain an insight into Elimelech’s state of mind. As he doubted the love and fatherhood of God he chose to step out of where God placed Him, going by his own strength. Naomi was bitter but she would once again turn and look to the Lord God of Israel in her home town Bethlehem. Yet not alone, as both her daughter in-laws respond to her by saying ‘we will surely return with you to your people.’ But only one fulfilled this promise. Orpah left. She decided it wasn’t for her! And sadly this is what happens with many Christians today. They come to the Lord (at countless alter calls) but where are they a few days later? No one ever sees them again. Or they may stay for a while, springing up quickly like the word says, yet when persecution or hardship comes like thorns encroaching ones growth, they leave the faith for a life more comfortable (Read the parable of the sower, Matt 13:3-9, 20-21). But Ruth, she stayed. In Ruth we have an awesome revelation of a true conversion. Even when others are leaving around her Ruth stands her ground, unshaken, not consumed by the thorns of life, she says in My favourite verse in this chapter, “Don’t urge me to leave you or to turn back from you. Where you go I will go, and where you stay I will stay. Your people will be my people and your God my God. Where you die I will die, and there I will be buried. May the Lord deal with me, be it ever so severely, if even death separates you and me.” (Ruth 1:16-17 NIV). Having counted the cost Ruth was willing to give up everything she knew and loved to follow Naomi, and Naomis’ God. A gentile becoming one of God’s own by CHOICE. I really don’t blame Naomi for her bitterness. Literally her pride and joy (husband and two sons) had gone to rest. Her changing her name from Naomi (joy/beauty) to Mara (bitter) was just an expression of her state. She was currently at a place of rock bottom thinking that the Lords hand was against her. But man oh man, it’s never the Lords plan for his children to stay at rock bottom. What I learnt from Ruth was her LOYALTY and her LONG-SUFFERING. – when she made the vows with her hubby till death do them part, she made it also with her in-laws. Verse 17 NKJV she says to Naomi “where you die, I will die and there will I be buried. The Lord do so to me, and more also, if anything but DEATH parts you and me”. How heartwarming? Nothing was going to break that unity she has for her Mother-in-law. One thing that really struck out to me was the meaning behind the names of the characters in this verse. I found that Elimelech means ‘God of the King’. From God’s perspective, that was how he saw Elimelech but unfortunately, He never lived up to his name, because he was living away from the Father, away from Bethlehem (which is the place of sustenance and provision). Elimelech was rather spiritually naive by giving his sons negative names; Mahlon meaning sickness and Chilion meaning Puny. This might have been the reasons why they died..? There is power behind the names we carry, which was a reason Naomi changed her name to Mara (bitter) as like Elimelech, when Naomi was in Moab, she could not live up to her name because she was living away from the Father’s house, away from His house of blessing. How do you value personal relationships? Secondly, Ruth is such an amazing character!!! She is a supreme example of someone who placed great value on personal relationships. In her dealings with Naomi, She showed loyalty, servanthood, diligence and moral righteousness. One of the key things we must remember about establishing and cultivating relationships, whether it be platonic or a boyfriend-girlfriend relationship, is to not make commitments too hastily, and wait until we understand the implications of being committed to someone. In verses 11-13, Naomi mentioned all the implications of following her to Judah, instead of returning to Moab, Orpah possibly realised that she could not engage in such a relationship. I respect this decision! If we know that we are not ready to commit to someone, walk away. Don’t proceed to pretend to be there for them, and then in their time of need, you’re nowhere to be found! Ruth is truly a faithful and loyal woman, verses 16-17 show how deep Ruth was prepared to go with Naomi. She was willing to leave her gods and serve the Most-High! which she was later rewarded for as she became an ancestress of David and Christ. This proves that God is a rewarder of those that diligently seek him! The last line “If anything but death parts you and me” highlights the greatest form of loyalty! This sort of loyalty mainly exists in marriages where it should be til death do you part! By already reading chapter 1 of Ruth, we can see that Ruth is sticking by Naomi, she is helping her, not wanting Naomi to be alone and that is what you call LOYALTY and SOLIDARITY. Naomi has been through so much by losing her husband and then losing both of her sons. 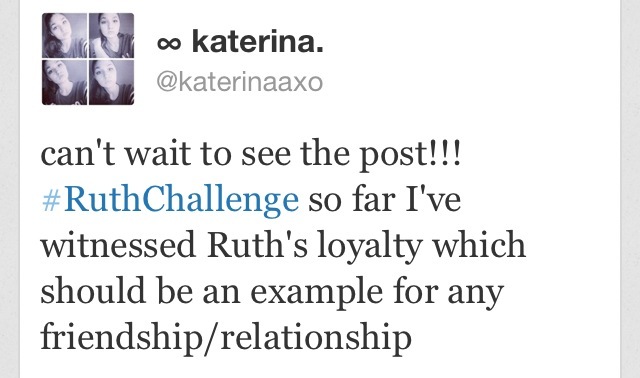 I admire Ruth, for so many reasons. Verse 21 spoke out to me loudest. Ruth’s statement in verse 16 was a beautiful, strong act of loyalty and love, I hear the courage in her words, she is adamant! This a women who is NOT moving- like nowhere, literally. Orpah comes across like the wimp in this chapter, sorry to say. She is out in a flash, I don’t blame her, We’ve all been there, instances where we take the easiest route out. Theres something extremely frightening and uncomfortable about not knowing what lies around the corner, how many times as women are we faced with situations and instances that we cannot see beyond the confusion that stands before us and what do we do? Take a U-turn. Ruth saw beyond the current circumstance, and trusted in her God. Ruth was not a mind reader she had no idea what would be of her and her mother inlaw, but her FAITH allowed her to stand strong. This is not just a testament of her love for Noami, but more subtly her trust and faith in God. Naomi is a broken women, she feels like there is nothing more to her existence, no husband, no sons and then no food… nooo, she is feeling like God is playing unfair. But this is where it hit me, God loves us, and will never ever break us down without building us up bigger and better. So this is where her faith should have kicked in, this is when she should have been PRAISING in advance! You know how they say good things fall apart so better things can come together. This is exactly it, ‘ for I know the thoughts that I think toward you, saith the Lord, thoughts of peace, not of evil’ Jeremiah 29:11. But hey I cant blame Naomi either, its so easy when down and out to feel the whole world is against you, including your creator but this is just is an example of where FAITH and TRUSTING should kick in. Knowing the God your dealing with is essential, this will eradicate any thoughts of depression, worry, sadness because you KNOW he has something better planned for you. Decisions: Reading from verses 1-22..we can see what befell the family of Naomi.,loosing all males almost at the same time,she had to go back home since she had nothing to do in Moab. Poor Naomi she must have felt so much sorrow…. Moving on!!! We see her daughters in-law’s persistence to follow her(Naomi)……Ruth And Orpah!! I’d like to settle on. their issue…at this particular moment when Naomi gave them a reasonable reason to turn their back!! A Decision had. to be made…but one decided to stay and the other go.. In my usual days of reading the book of Ruth,I had always though orpah was stupid and self-centred,but ‘NO’ I was wrong..